Farmer Jenny Mennenga holds soybean seeds from the previous year at her family farm near LeRoy, Ill., on Jan. 26, 2015. The mediocre soybean yields, she said, were largely related to her farm’s ongoing struggle with “super weeds,” tough weeds that have grown resistant to the herbicides used to kill them. For more on efforts to curb herbicide-resistant weeds, also see: "Monsanto inches closer to biggest biotech launch in company’s history"
Farmers everywhere are fighting a similar battle. An international survey funded by government, academic and industry groups identified more than 400 different herbicide-resistant weeds globally. In addition to water hemp and marestail, Palmer Amaranth, nightshade, prickly lettuce and clover are all prominent weeds that have gained resistance to herbicides. And controlling those weeds can be costly. Mennenga said she spent $40 an acre last year on control efforts for the weed waterhemp alone. For more about the GMO concerns, also see: "GM soybean, cotton deregulation prompts herbicide concerns"
Similar to the weeds on Mennenga’s farm, most super weeds are resistant to glyphosate, the herbicide used with Monsanto’s genetically engineered Roundup Ready crops from the 1990s. To kill the weeds that have grown immune to glyphosate, Monsanto is working on a next generation of genetically engineered seeds designed to also be used with a different, older herbicide formulated from dicamba. 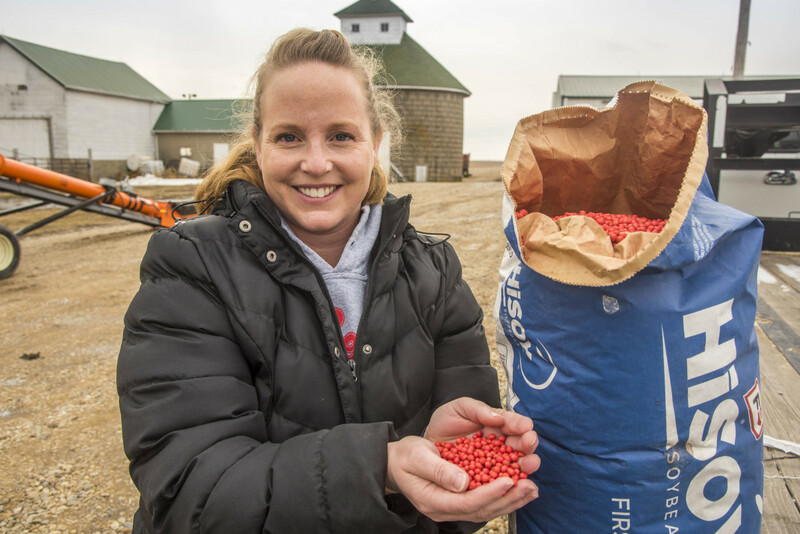 Farmer Jenny Mennenga holds soybean seeds at her family farm in central Illinois on Jan. 26, 2015. The U.S. Department of Agriculture deregulated two of those next generation varieties – soybean and cotton – in January. “As a farmer, I am very supportive of the dicamba soybeans,” Mennenga said. 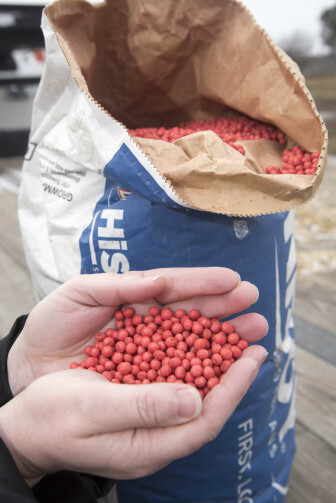 The soybean and cotton will be part of Monsanto’s Roundup Ready Xtend brand projected to go to market in 2016. Before the soybean and cotton can be commercialized, the Environmental Protection Agency must sign off on their related herbicide use. Brian Diers is a professor in the crop sciences department at the University of Illinois. In the future, he said, it is likely companies will continue pumping out genetically engineered crops designed to withstand multiple herbicides. “What we’re probably going to be seeing in the future is more crops coming out with additional genes that give resistance to other herbicides,” said Diers, who specializes in soybean breeding and genetics. Marestail infests a cotton field. Marestail is just one of hundreds of weeds that have become resistant to popular herbicides. Larry McClendon is a fourth-generation cotton grower who farms anywhere from 5,000 to 10,000 acres a year in eastern Arkansas. He voiced his support for the recently deregulated Monsanto cotton during a USDA public meeting in September. “As a farmer, I can say with a lot of confidence that growers need new weed management technologies,” he said, according to transcripts from the meeting. Bruce Tiffany is a soybean, corn, sweet corn, cattle and sheep farmer in Minnesota. He, too, expressed support for the Monsanto technology. Under a special permit granted by the Animal and Plant Health Inspection Service, Tiffany is one of the select few U.S. farmers who has been able to grow Monsanto’s dicamba-resistant soybean before commercialization. “My experience is the weed control system is effective, economical, safe for the operator and environmentally responsible,” Tiffany said, according to transcripts. But while Mennenga, McClendon, Tiffany and other farmers applaud the new Monsanto soybean and cotton, critics argue the move is shortsighted and will only lead to the further reliance on herbicide. 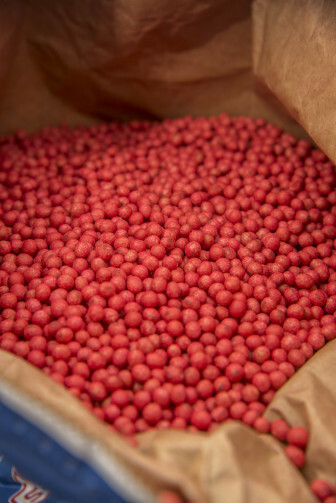 Most soybean acres are planted with a genetically modified seed, such as the ones shown here, according to the USDA. If Monsanto’s genetically engineered cotton and soybean became commercially available, farmers would widely replace their old Roundup Ready, glyphosate-tolerant seeds with the new dicamba-tolerant ones, Gurian-Sherman said. As a result, they would begin the same cycle that produced the glyphosate-tolerant weeds originally. The Center for Food Safety, a national nonprofit and public interest organization, projects that the majority of all cotton and soybean crops would become dicamba-resistant. Instead of turning to a different herbicide to kill the resilient weeds, Gurian-Sherman said farmers should use alternative methods. However, according to studies cited in a USDA analysis, those methods would lead to steep financial losses for farmers. If growers decreased herbicide use by shifting to more hand weeding and tillage, U.S. crop production would decline by 20 percent with a $16 billion loss in value. 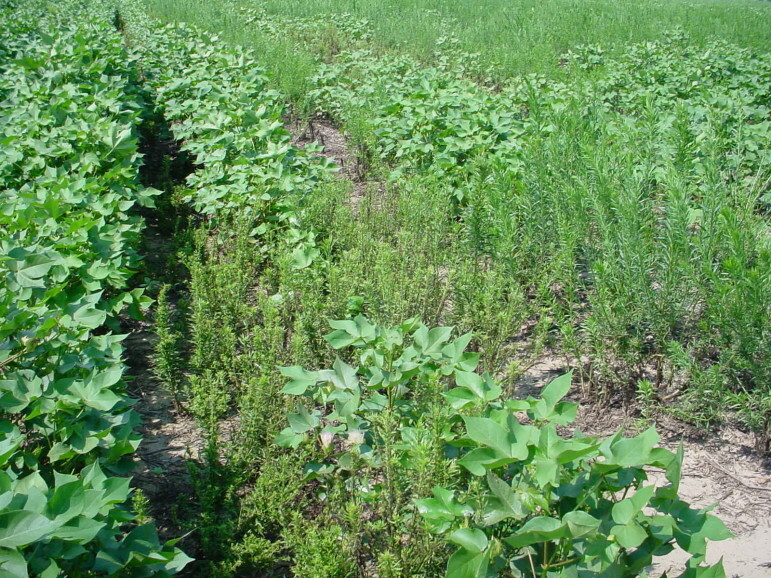 Researchers estimate weeds cause about 37 percent of the world’s soybean production loss. And – even if farmers shifted to methods outside of genetically modified crops and herbicides – it’s likely the weeds would still find a way to adapt and continue to bother farmers. “The problem is that, in any of these kinds of situations, nature is eventually going to win,” Diers said.